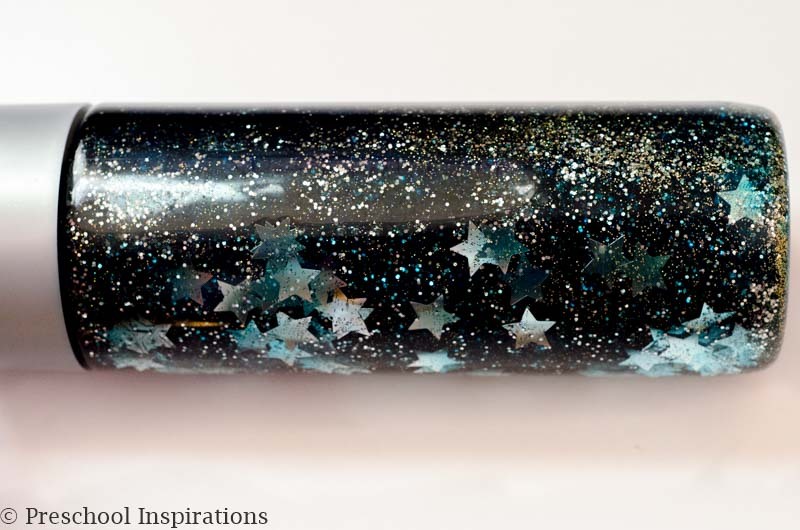 With three ingredients you can make this stunning galaxy calm down bottle! This would also be perfect for the little ones who love learning about space! 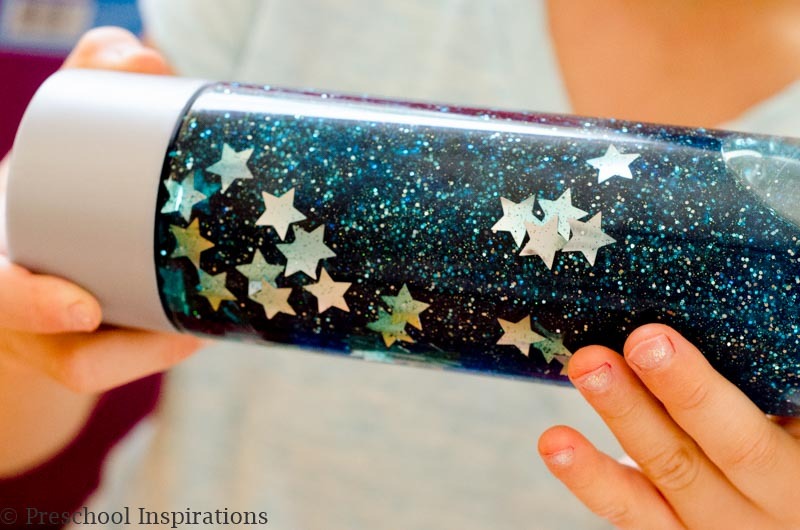 Every year I love making a space themed activity, and this bottle is inspired by an amazing slime over at Two-daloo: Galaxy Slime. Calm down bottles and calm down jars are great for teaching children self-regulation. And they are just amazing to look it. Calm down bottles are for all ages, babies to adults! They’re great for use at home, or are wonderful to add to a preschool curriculum. This is one of the easiest calm down bottles to make ever! No special techniques are necessary, and if you have never made one before, this might be the perfect one to practice on. You only need three ingredients to make this! I used a VOSS water bottle for this. You can read about where to find them and what other bottles are a good alternative in my post How to Make a Perfect Sensory Bottle. I love VOSS water so I pour it into another glass to drink and use the VOSS bottle for all of my many sensory bottles and discovery bottles. Mineral oil and baby oil are one in the same. They are sold at drug stores, many grocery stores, some dollar stores, and online. Get enough to fill up most of your water bottle. 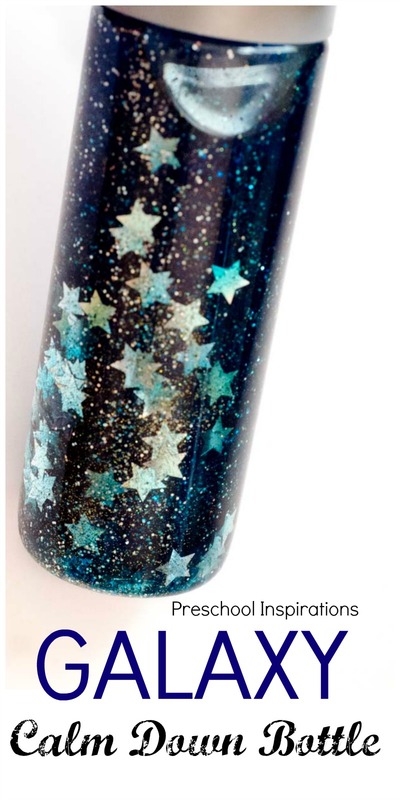 I chose mineral oil because I want the confetti stars to last a long time. I’ll keep you updated on that! Candy dye is a must! Liquid watercolor and food coloring are not oil based, so do not use those! I found my candy coloring at Michael’s, but it was the third craft store I hit, so I would probably just get it online next time to avoid the hassle of hunting it down! There are two types of candy coloring. I got the one with the primary colors. 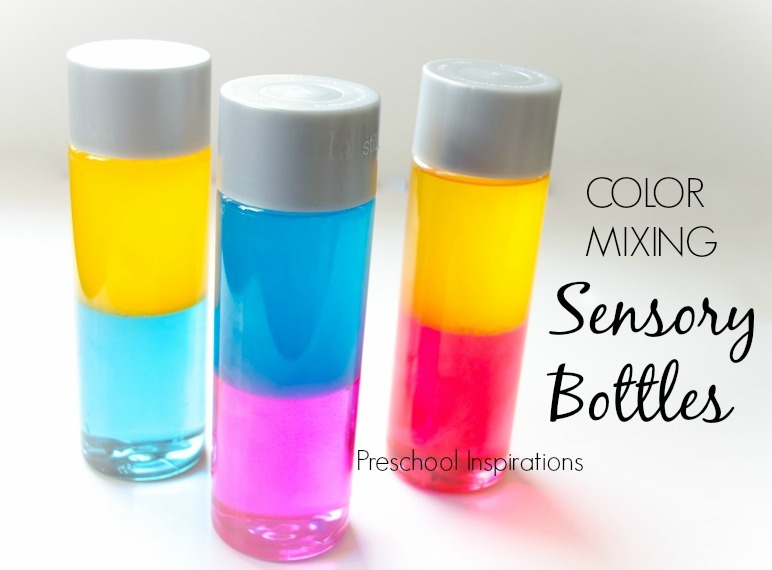 I also used the candy coloring to make these color mixing sensory bottles! Star confetti is at craft stores or you can find it online. I bought mine from Amazon because I am a Prime Member and highly addicted to free shipping! Glitter is a perfect touch to this. I used three different types. I just used what I had at home already and made no special trips to the store. I used silver glitter from the dollar store as well as black and gold fine glitter from the craft store. I wanted to use silver fine glitter, but I was completely out from all of the other calm down jars I’ve already made. Pour the mineral oil into your empty water bottle. Feel free to use a funnel for this. I leave the top part of the water bottle empty. With the VOSS bottles I put just enough to go near the lid. You just want enough space to easily mix your bottle. Add some blue candy coloring dye next. I put in about ½ teaspoon. Add as much as you like until you get the color you want! Caution: This is messy and stains! I always handle this part and let the kids do the other parts! Add the confetti stars! I used about 1/3 of the package and then put the rest in some Starry Night Sky Slime! Now add some glitter if desired. Since this is mineral oil, any glitter will work great. I used silver glitter from the dollar store as well as some fine glitter I already had around in black and gold. You can use any color. Lastly, glue on the lid! I use Gorilla Glue and check it every few months to make sure it stays on. You would NOT want mineral oil all over your floor! I love that the gold almost gave a shooting star appearance! Now give your beautiful galaxy calm down bottle a nice shake and enjoy! Yay, so exciting! If you do anything to make even more incredible, do tell!! I love this calming bottle. What color(s) did you use to dye the mineral oil? Great question! Add blue :). And I adjusted the instructions so that they say that now! I hope you love making your own! I just made one of these for my classroom of 1 & 2 year olds! Love it so much! Thank you for sharing! I am so thrilled to hear that, Jana! What a lucky class you have :). I’m a bit worried about giving my sometimes volatile 3 yr old a glass call down bottle. Though it does look awesome, I can see dented furniture and bumped heads in my future. Any recommendations for a good looking plastic bottle to use? It’s a plastic bottle :). There are both available, and I always get plastic. But here are my recommendations for many more bottles that are great too. I can’t wait to make some of your bottles for my kids 🙂 I was wondering though if you have ever tried glow in the dark glitter in the mineral oil? If so, how did it work out? Thanks! Glow in the dark glitter sounds incredible, but I’ve never tried it! If you do, definitely let me know :). Hi katie! Nice work 🙂 How if i change the oil with glycerin? Hi Dewi! I’ve definitely made calm down bottles with glycerin :). Great idea. Is baby oil an equal substitute to mineral oil? What’s the benefit of using oil instead of water? Water will rust the metallic stars after a short period of time unfortunately. Corn syrup can be substituted as well. I am not sure what the long term results are for that though. You can also use a little oil based paint to color the oil. I found a 24 color assortment for $14.99 at my local craft store. I just made this for my son. I couldn’t find candy dye but I used candle wax dye and it worked just as well. Definitely put too much glitter in though. Still looks pretty. Will probably make again with less glitter next time. Do you fill the whole bottle with mineral oil or oil and water and how much of each? Hi Amy, I used 100% mineral oil. You could do it either way, but the water will cause the stars to go bad in about a month typically. I added a couple of little green aliens from an old toy story kerplunk game and that was fun. Mine didn’t move much but my kids loved it until the glass jar shattered, definitely taking your advice on the plastic one next time. (I just can’t find them)Oh and i used a powdered candy food coloring and that worked great. Might be why my glitter and stars moved very slowly though. What kind of glue did you use on the lid? My favorite kind is Gorilla Glue! Thank you for this tutorial! I just made one out of a rocket-shaped bottle that once held bubble mix. It felt like the perfect use for it! I made these witht my students today. The gorilla super glue did not keep the lid secure. What else can I used to secure the lids? I just made one and my glitter is moving suuuuuuuper slow. Any troubleshooting suggestions? Get access to my VIP Subscriber Library and my weekly resources.